This is cute. Unfortunately, it will probably be less cute once you actually fill it to capacity. But still better than giving on style for function altogether. 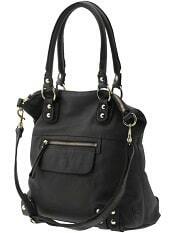 Just not sure I want a black bag now that spring is almost here…. This is a perfectly nice bag, but there are sooo many decent leather bags for sale out there, if I were forking over $400, I’d look for one that was originally like $800, on sale half price. Better bag, same money. Also, I wish they’d line all bags in pale fabric. Black lining = I can’t find things in there. Pale fabric = more light. Ok, it will get grubby, but no one sees in there but me. I once lost my temper and turned a bag inside out and used white fabric paint on the lining. Worked great. Looks like wannabe Balenciaga, sorry. Ooh, me likey. I’ve had a bag v. similar to this for the last year that I got from Bluefly, and the straps are starting to wear. I love anything I can sling across my body — helps when you’re toting heels + files. I used to buy expensive bags – one Coach after another. Have totally changed my philosophy and now get bags I can throw away at the end of each season. I think you can get more bang for your buck in many other ways. A handbag really does not enhance your appearance, because it is not clothing. I think someone with $400.00 to spend on non-clothing might do better to buy some really nice costume jewlery – or even real jewelry. This too will go out of style, but at least it will not get dirty or wear out, right? I’ve moved in the opposite direction! While I enjoy some fun, throw away bags for summer, I now spend more for more solidly constructed purses for work. They last longer while still looking good. I definitely think a handbag is almost like clothing and that it does enhance or detract from one’s overall appearance.